A quick refresher on hockey’s new statistics: puck possession correlates more strongly with winning than do things like goals or shots; measuring possession in a fluid game like hockey is difficult; as a practical solution, Corsi and its less-inclusive sibling, Fenwick, are statistics that track certain, more easily measured events (all shots, including on-goal shots and missed shots, and, in Corsi’s case, blocked shots), thereby serving as proxies for possession and, therefore, indicators of team success. Once you get past the names (as the NHL is in the process of doing), the concept is simple. One way to improve Corsi might be to make it more comprehensive. If Corsi approximates possession by counting certain indicia of possession, it stands to reason that a similar metric could better approximate possession by counting more indicia of possession. In looking for other things to add, and keeping in mind that the practical computational benefit of Corsi is that it is comprised of easily tallied events, pass attempts– including both completed and unsuccessful passes– would seem to meet both criteria. Pass attempts indicate possession the same way shot attempts, as broadly defined under Corsi, do, and they should be nearly as easy to count. I can think of two potential reasons why it might not make sense to expand Corsi to include pass attempts: 1) it is significantly more difficult to identify and count pass attempts than the shot attempts already being tracked, and 2) adding pass attempts to a possession proxy metric like Corsi does not significantly increase the value of the metric. While the first might be true, it also may make it easier to collect more events. For the limited purposes of a relatively simple metric like Corsi, there should be no need to code or label the component events compiled into the single Corsi output. Adding pass attempts would save trackers from having to decide whether to include or exclude an ambiguous shot-attemptish thing. As for the second, I attempted to address this with someone who has written on the general subject, but, likely due to my own ineptitude, the exchange resembled two ships passing in the night, which is a terrible and sufficient way to conclude this post. At 37-8, the once-middling Atlanta Hawks have the second-best record in the NBA. If they beat Brooklyn tonight, they’ll match last season’s win total with more than two months to go in the regular season. Did anyone see this coming? Yes, last year’s Hawks snuck into the playoffs and nearly knocked off the top-seeded Indiana Pacers. And observers should have noted the significant number of games the Hawks’ top players missed due to injuries last season; a healthy team couldn’t help but be better. But this much better? The most important difference seems to be a new coach, former Greg Popovich understudy Mike Budenholzer, who knows how to utilize the players he has, and a group of players that is on board with and executing their brand of team-oriented basketball. Indeed, as numerous writers have observed,* Atlanta is scoring more by passing more. They have the fourth-best field-goal percentage, and of those field goals they make, more than sixty percent of the two-pointers and nearly ninety-three percent of the threes are assisted. Both of those rates lead the NBA. Behind them: the equally high-flying Warriors, the only team with a better record (36-7). The principle that passing, rather than isolation play, is the best way to generate good shooting in the NBA also seems to apply in the NHL, where new research indicates that teams generally score at a higher rate on assisted shots as compared to unassisted shots. When further breaking down the assisted shooting percentage into shots generated by one pass and shots generated by two passes, the difference between assisted and unassisted shooting percentage can be extreme. One example is the Florida Panthers, with an unassisted shooting percentage of about 5.5% and a two-pass assisted shooting percentage of nearly thirteen percent. It probably shouldn’t be surprising that similar strategies would be similarly effective in generally similar sports (five active players per team engaged in free-flowing gameplay). With camera-driven player-tracking technology recently implemented in the NBA and on its way to the NHL, perhaps the rudimentary analogy set forth above can serve as a call for inter-sport collaboration between basketball and hockey analysts. 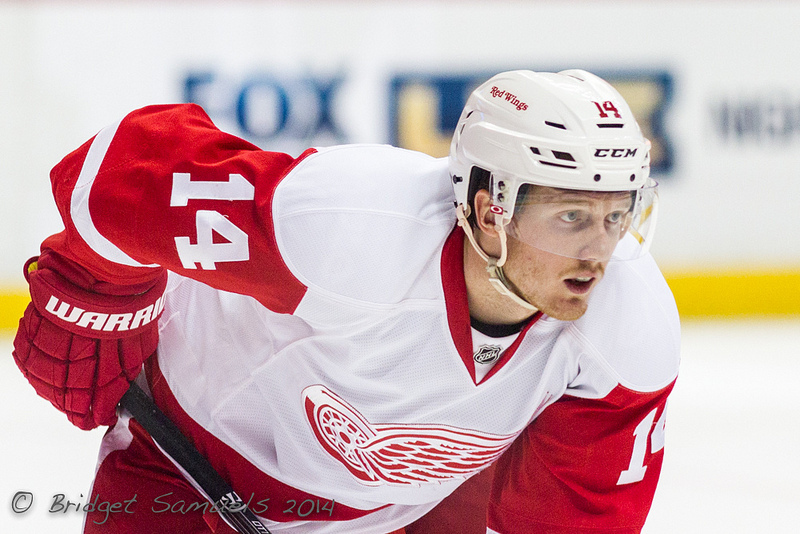 More like Gustav Nyquist Prospectus. The generous folks at Hockey Prospectus have offered up the Red Wings chapter from their annual season preview free of charge. Despite laudatory language sure to please any Detroit fan, HP projects the Wings to be worse this season than they were last season, and one of the worst teams in the league overall. Chapter author Adam Gretz‘s thesis is that the Datsyuk-Zetterberg era is coming to a close (just as I’d learned how to spell their names! ), and, with next-gen’er Nyquist’s meteoric scoring rate due for a regression, the depth and readiness of Detroit’s prospects will be tested. As for the individual players, HP projects notable improvement over last season’s performance for Justin Abdelkader, Datsyuk(! ), and (EGR’s own) Luke Glendening. On the downside, they see regression for Johan Franzen, who already was facing criticism for a perceived lack of production at the end of last season. To date, the Red Wings sit in fourth place in their division. They have the eleventh-most points overall, suggesting that, at least for the first quarter of the season, they’ve outplayed their expectations. With the Stanley Cup finals set to start tonight, I thought this would be a fun game to play, especially for hockey fans whose teams are done for the season. Jarri Kurri ($1) and Bucyk ($1) – “both Hall of Famers” and “building a top-heavy team with a few stars and a bunch of lesser players is not such a bad thing.